I started to watch Drishyam late one night intending to just watch the first half, but found I couldn’t tear myself away until I’d seen all 2 hours and 44 minutes of the film – it’s that kind of movie. Although it starts simply enough by drawing a picture of a fairly conventional family, it develops into a fascinating thriller where it’s difficult to predict exactly what will happen next. The very ordinariness of the family makes their reactions and those of the other characters unexpected, while the developments in the plot are surprising at every turn. There are a few moments where the story falters a little, but overall it’s intelligently written to show the effects of a sudden crisis and how important it is for a family to stick together when faced with adversity. Great performances by all the cast and beautiful cinematography contribute to make Drishyam compelling viewing and it’s definitely one of the best Malayalam films I’ve seen recently. The film has a fairly slow beginning as writer/director Jeethu Joseph spends the first hour developing the characters of George Kutty and his family, focusing on their day to day interactions with each other and various other people they meet. 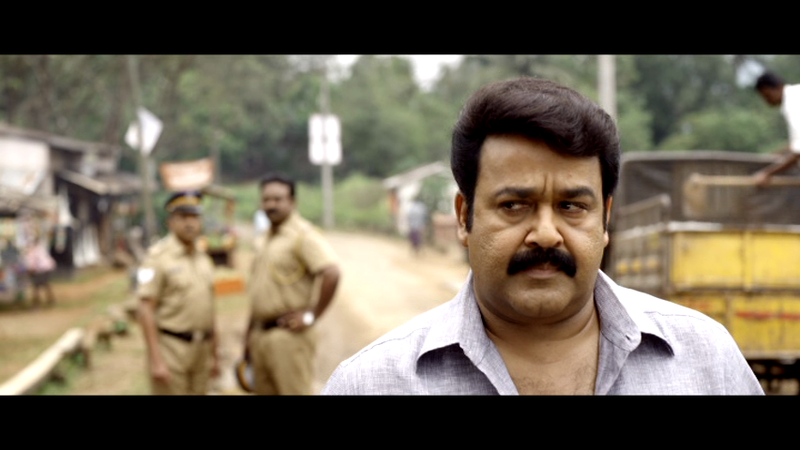 George Kutty (Mohanlal) operates a cable TV business in a small village near Thodupuzha. He’s an orphan who never made it any further than 4th standard at school, but he has a wealth of knowledge gleaned from watching films all night long in his office. George Kutty is married to Rani (Meena) who generally seems content with her life despite putting up with her husband’s absences at night and his obsession with saving money. They have two children, Anju (Ansiba Hassan) and Anu (Esther), and the family lives in a pretty house surrounded by banana trees and woodland. It all seems, if not idyllic at least comfortable and happy, although there are of course the dull routines and petty squabbles that occur in any family. Jeethu Joseph uses each family member’s small ambitions to round out their characters and define their relationships while gradually building up the background for the rest of the story. What also stands out is that despite the bickering and George Kutty’s somewhat eccentric lifestyle, there is a lot of love in the family and the marriage is built on very solid ground. 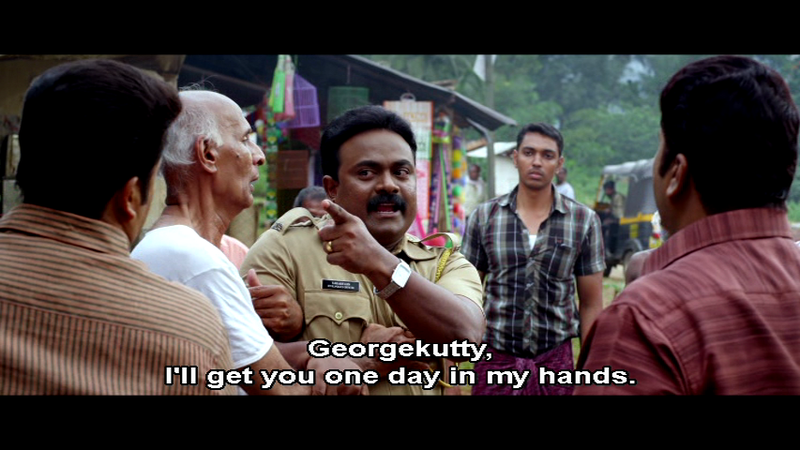 When not in his office or sitting at home, George Kutty spends his time in a local tea shop where he uses his knowledge of films to solve other people’s problems and if that just happens to antagonise the moderately corrupt Constable Sahadevan (Kalabhavan Shajohn), so much the better. Sahadevan is a bully who extorts money through a variety of petty schemes and his character is best summed up by a brief scene where he happily steals money from a man whose child is in hospital. 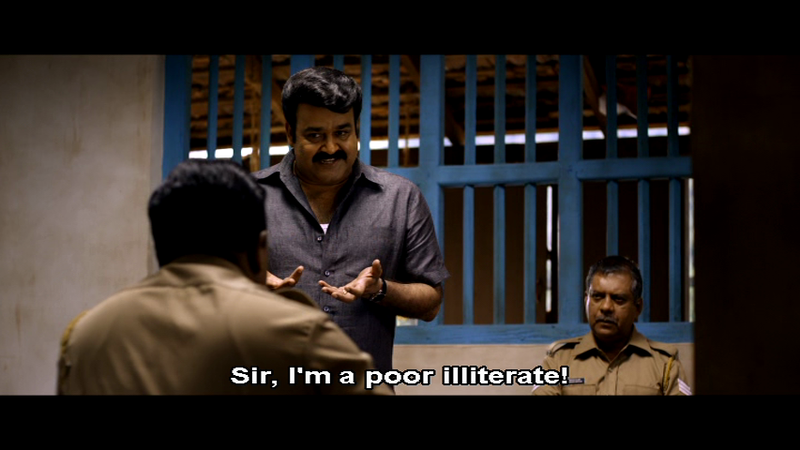 Such a nasty man, and beautifully played by Kalabhavan Shajohn who does a fantastic job of displaying Sahadevan’s mean-spirited character and giving his emotions free rein. Part of the intrigue of the story is that this dishonest policeman becomes the unlikely pursuer of justice although his methods are definitely unethical and disturbing. 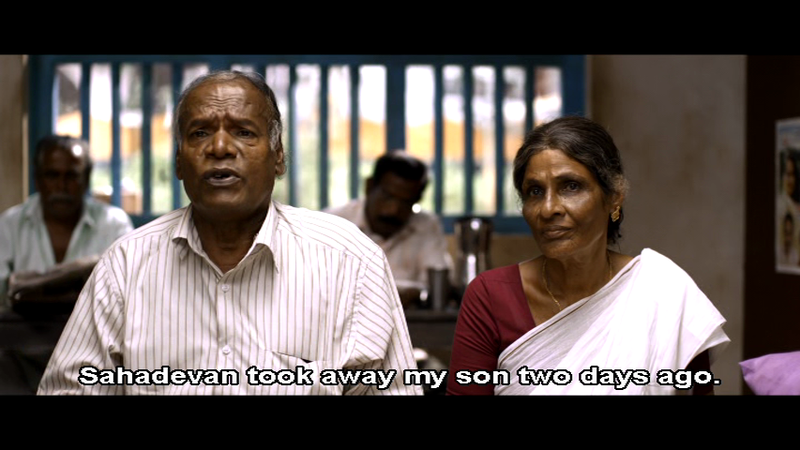 While the first half of the film introduces George Kutty and his family, the second half deals with what happens when the police suspect they are complicit in the disappearance of the Inspector General’s son. 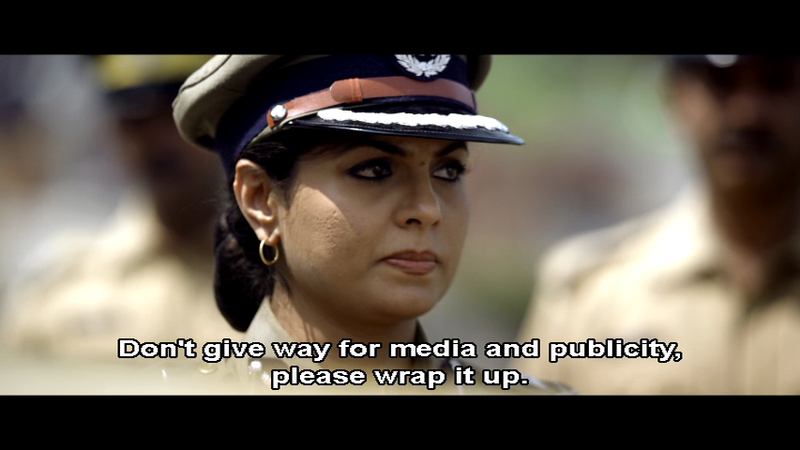 Geetha Prabhakar (Asha Sarath) plays the part of the IG, and it’s a pleasant surprise to have a high ranking female officer as a main character. 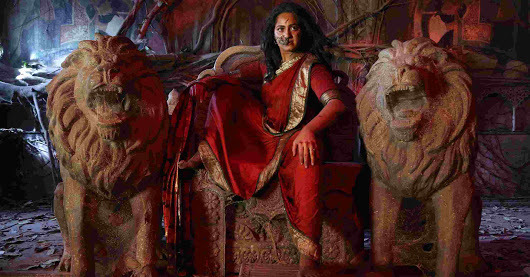 Perhaps this is as a counterbalance to George Kutty’s firmly held belief that a woman belongs at home, but it also brings a very different dynamic to the film. Geetha is the one making all the decisions while her husband (Siddique) is the voice of reason and conciliation in the background. The missing Varun Prabhakar (Roshan Basheer) is a typically spoilt rich kid, and there is the inevitable cliché here that rich kids are bad, while kids from lower and middle socio-economic backgrounds are always good and righteous. Geetha doesn’t believe George Kutty’s version of events and is determined to prove that his family are lying even though the local police officers (with the exception of Sahadevan) are convinced of George Kutty’s innocence and are reluctant to get involved. It’s mesmerising and even though the audience knows the true sequence of events, subsequent outcomes are impossible to anticipate as everyone brings their own needs and responsibilities into the mix. Keeping to the thriller aspect of the film, there are only 2 songs in the whole film. Both are well used to describe George Kutty and the dynamics within the family. The first shows them on a happy shopping expedition while the second illustrates the change in family attitude when the police start to suspect they may have something to hide. This is the first happy song which does an excellent job of summing up the family and their personalities. Part of the film’s effectiveness is due to the high standard of acting from all involved. 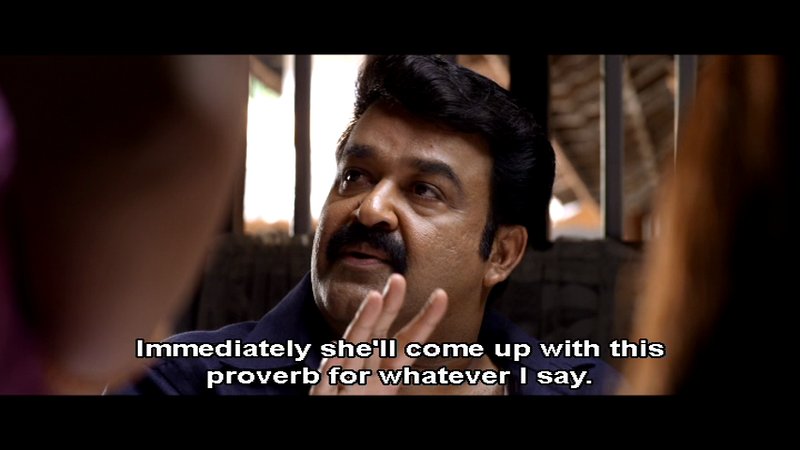 Mohanlal is outstanding as are the two young actors who play his daughters. 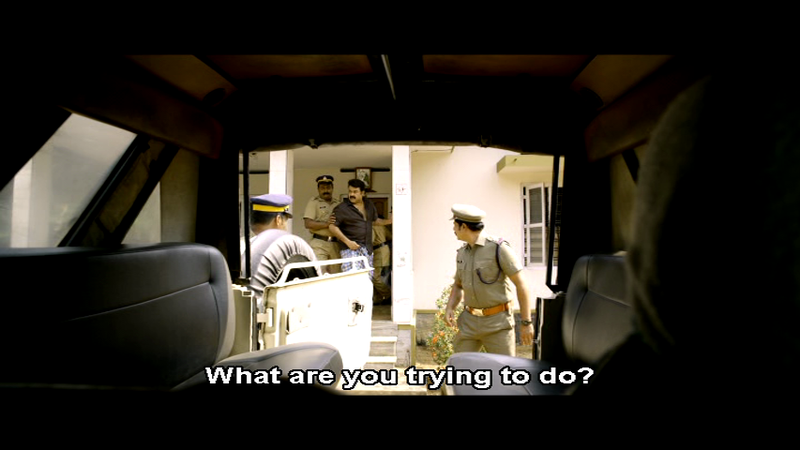 Meena, Asha Sarath and Kalabhavan Shajohn are all also excellent and from Sahadevan’s brutal interrogations and shifty plotting to Geetha’s desperate attempt to balance her police persona with a mother’s concern for her missing son, the actions all feel genuine and typical of the characters involved. 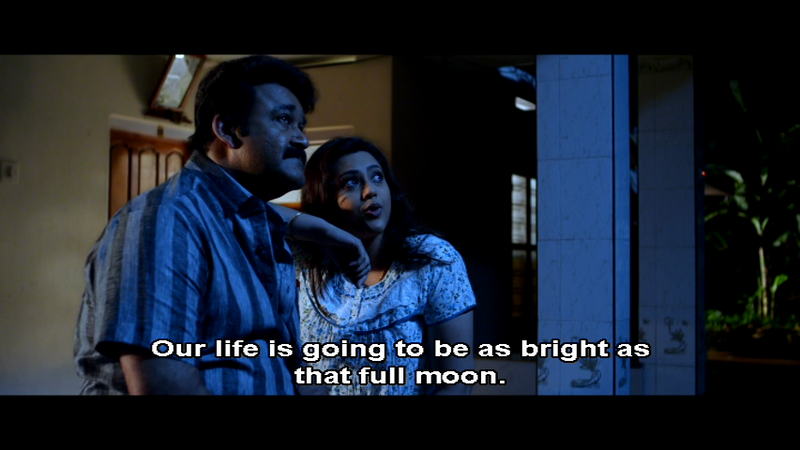 The dialogue seems natural, even with the barrier of subtitles, and the only apparent misstep occurs at the very end where Geetha appears to act a little out of character. However it’s a small thing and does allow the story to be completely wrapped up Hollywood style. Personally I would have liked a little less explanation and have been left to form my own theory, but that could be just me. 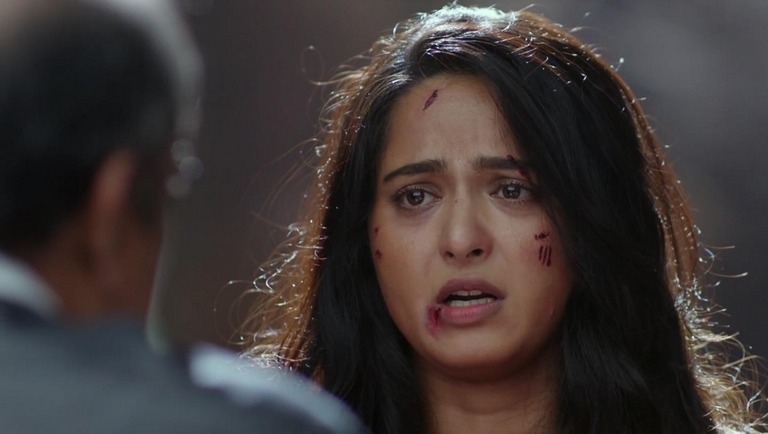 The film is beautifully shot by cinematographer Sujith Vasudev and once the family is under suspicion the threat of prison is accentuated by the number of shots behind barred windows. There are also some good contrasts between George Kutty’s family and the extended ‘family’ of the police and the lone outsider of Sahadevan. By the end of the film a number of small throwaway moments are shown to have more significance than they appeared to have at the time, which shows just how effective good story development and intelligent writing can be. Everything was there to be seen for anyone who looked, but the film shows that what we see can be easily manipulated and misinterpreted when it is outside expectations. Definitely recommended viewing but be warned not to start watching too late at night as it’s impossible to stop! 4 ½ stars.